Jammu, November 06 (Scoop News)-To showcase the adventure spirit of the “Indian Army" to the youth of the Country the Army Adventure Wing is undertaking a Trans India : North – South Hot Air Ballooning Expedition, from Jammu and Kashmir to Kanyakumari, covering a distance of approximately 3236 Kms. The Army dedicates the expedition ‘Jai Bharat’ to the martyrs of our Nation and national integration. 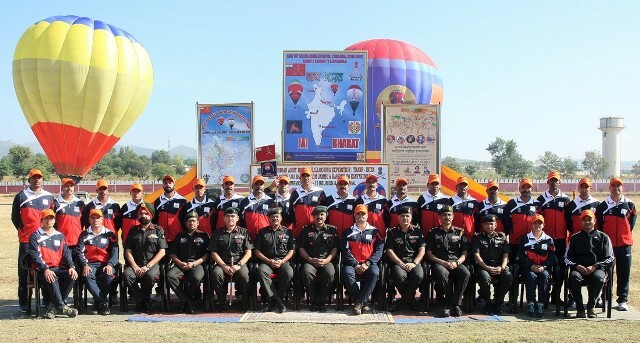 As part of the expedition the Army will be flying two balloons flying across the country touching, a total of 31 stations wherein, Aero shows will be conducted by this team. The Joint Hot Air Ballooning Expedition team of JAK RIF RC and 3 EME Centre Bhopal embraced on a trans India North – South Expedition on Tuesday. Maj Gen Sharad Kapur, General Officer Commanding, “Tiger Division”, flagged off the expedition in a impressive ceremony at Zorawar Stadium which was attended by large number of school children, ex-servicemen, soldiers and their families at Jammu.